If you know me very well at all, you will know that I love accessories! I love to wear big chunky necklaces, large stud earrings, scarfs, and layered bracelets. Accessorizing is my game! In April I got a different type of accessory. 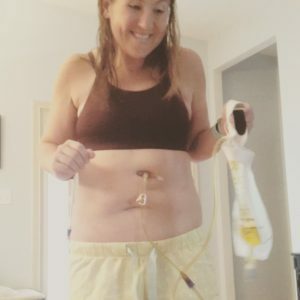 I had my gastrostomy tube (G-tube) placed. Originally it was placed for feeding if I lost too much weight following surgery, but I never did use it for that purpose. My stomach was reconstructed and the part with the G-tube is still non-functional. It does not empty, but rather bile and stomach acid backs-up and cause pressure the pushes these contents out leaking around the tube and slimming my belly unless I have it hooked to a drain bag. Given the choice of having caustic slim oozing out of my belly or attaching a tube with drainage bag, I chose the later. You may have noticed that in all of my pictures this summer I have worn dresses or if not wearing a dress I was sporting a very fashionable fanny pack! These are these are the occasions that I chose the drain bag, but in running pictures I didn’t have the bag! These are the occasions were I would embrace the slim! Tomorrow everything will change! Tomorrow I will have surgery to remove the remaining stomach and the tube! As a pharmacist working with patients receiving nutrition support, I always thought of a G-tube as a benign accessory. I realized that there would be some pain associated with placement, but expected that once the site had healed, it would not cause any issues. This was a very wrong assumption! Some days this would be a fair assumption and I don’t notice it being there much at all. It doesn’t hurt and can be forgotten. Other days it can be super painful! Because I have so much drainage, even when I have the bag attached I often have gastric acid and bile leak out around the tube. This causes irritation of the skin and causes granulation tissue (fresh new tissue that is trying to repair damaged tissue) to form. This granulation tissue can grow out of control and even put stress on the tube an displace it causing even more pain. It also bleeds a lot and causes more irritation. The tissue can be stunted by treating it with silver nitrate sticks that essentially burn the tissue and cause it to sluff off. This treatment burns and then when it comes off it also bleeds and seeps. As if this isn’t enough, when the bag is attached to the tube it pulls on the inner tube and puts tension on the stoma causing more leaking. If I don’t wear the bag, I have the caustic slim pouring out around the tube and burning my skin. There is not really a winning solution! I don’t write this with the intention to gross you out, but to give the true patient experience of what it is like to have a G-tube. I realize that my situation may be atypical because of the high amount of drainage from my tube, but this is not something that I ever expected! Needless to say, I am super excited the the surgery tomorrow and a break from my little friend! Thanks for sharing your experience and your willingness to be open and honest. Thinking of you during this post surgical period and sending healing and celebratory thoughts your way!